Local family-owned and operated (not a broker), Robinson Waste proudly provides PA porta potty rentals with the most reliable rental service and reasonably priced porta potty rentals in Pennsylvania. We provide portable toilet rentals and restroom trailers in parts of Philadelphia as well as Delaware county PA.
Let us assist you in Pennsylvania. We gladly will provide free, no nonsense rental price quotes for any porta potty need you might have. Your phone call will be answered by one of our friendly porta potty rental experts who will help you to rent for your project. We will ask a few quick questions about your plans. How many people will be using the facilities? Where does the porta potty rental needs to be delivered? How long you will the PA porta potty rental for? 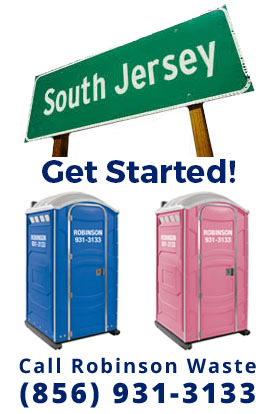 A large variety of PA porta potty rental units to choose from, we rent portable toilets in a blue or pink (perfect for Breast Cancer events) color. From the standard porta potty rental to flushable VIP units and wheelchair ADA accessible porta potty units, please know we can handle your needs. We have hand wash stations too! Let’s Get Started. Call Us for Porta Potty Rental Help! Robinson Waste provides the lowest porta potty rental price quotes with the most reliable portable toilet service in the Philadelphia, Delaware county PA or South Jersey area.